An overview of the liturgical season known as Ordinary Time which is represented by the liturgical color green. The rhythm of the liturgical seasons reflects the rhythm of life — with its celebrations of anniversaries and its seasons of quiet growth and maturing. Ordinary Time, meaning ordered or numbered time, is celebrated in two segments: from the Monday following the Baptism of Our Lord up to Ash Wednesday; and from Pentecost Monday to the First Sunday of Advent. This makes it the largest season of the Liturgical Year. In vestments usually green, the color of hope and growth, the Church counts the thirty-three or thirty-four Sundays of Ordinary Time, inviting her children to meditate upon the whole mystery of Christ – his life, miracles and teachings – in the light of his Resurrection. If the faithful are to mature in the spiritual life and increase in faith, they must descend the great mountain peaks of Easter and Christmas in order to "pasture" in the vast verdant meadows of tempus per annum, or Ordinary Time. Sunday by Sunday, the Pilgrim Church marks her journey through the tempus per annum as she processes through time toward eternity. For a penetrating look at how the seasons of the year interlock with the seasons of our lives read Dr. Jeffrey Mirus' article Seasons: The Lesson of Life. In her revision of the Liturgy, the Church has sought to reestablish the preeminence of Sunday, that feast day par excellence, over every other feast day. Recognizing, too, that Our Lord is really present when Sacred Scripture is read during the Liturgy, she has opened up the "treasures of the bible so that richer fare may be provided for the faithful at the table of God's Word." To encourage her children to have a "warm and living love for Scripture," the Church has enlarged the Sunday Lectionary so that the various books of the New Testaments are read roughly from beginning to end over a period of weeks, and the synoptic Gospels are read in a 3 year cycle Year A – Matthew; Year B – Mark; Year C – Luke. Old Testament readings and Psalms are chosen to correspond to the Gospel passages and to bring out the fulfillment of the Old Testament in the New. The revised weekday lectionary for Ordinary Time complements the Sunday lectionary with its 2-year cycle of readings presenting all the major portions of the Bible, and a 1-year cycle for the Gospels of Matthew, Mark and Luke. While insisting that the feasts that commemorate the mysteries of salvation take precedence, the Church nonetheless includes the celebration of the feast days of the Blessed Virgin Mary and of the saints in the liturgical calendar. "By inserting into the annual cycle the commemoration of the martyrs and other saints on the occasion of their anniversaries, 'the Church proclaims the Easter mystery of the saints who suffered with Christ and with him are now glorified.' (Sacrosanctum Concilium, 102) When celebrated in the true spirit of the liturgy, the commemoration of the saints does not obscure the centrality of Christ, but on the contrary extols it…"
Parents are challenged to keep the Easter mystery alive in their families throughout the season of Ordinary Time; to focus on the mysteries of Christ which the Church sets before them in the weekly Mass readings and to apply those readings to their daily lives. In this way, faith will bear fruit within their homes, intensifying through the fertile weeks of Ordinary time until its conclusion, the crowning feast of Christ the King. At the close of every Liturgical Year may we look forward with renewed hope to Christ's coming again in glory to reign as Lord forever. 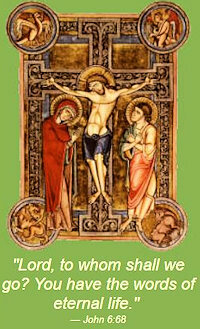 For it is Jesus Christ we seek when we strive to live the Liturgical Year with the Church. He is the "Lord of time; he is its beginning and its end; every year, every day and every moment are embraced by his Incarnation and resurrection, and thus become part of the 'fullness of time'." 1 Dies Domini, #76 "But there is another rhythm which soon established itself: the annual liturgical cycle. Human psychology in fact desires the celebration of anniversaries, associating the return of dates and seasons with the remembrance of past events." 2 Dies Domini, #37 "As the Church journeys through time, the reference to Christ's resurrection and the weekly recurrence of this solemn memorial help to remind us of the pilgrim and eschatological character of the People of God. 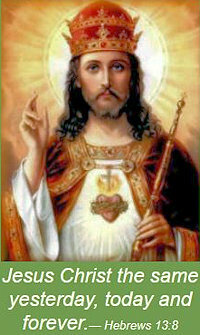 Sunday after Sunday the Church moves toward the final "Lord's Day," that Sunday which knows no end. The expectation of Christ's coming is inscribed in the very mystery of the Church and is evidenced in every Eucharistic celebration. But, with its specific remembrance of the glory of the Risen Christ, the Lord's Day recalls with greater intensity the future glory of this "return". This makes Sunday the day on which the Church, showing forth more clearly her identity as "Bride," anticipates in some sense the eschatological reality of the heavenly Jerusalem. 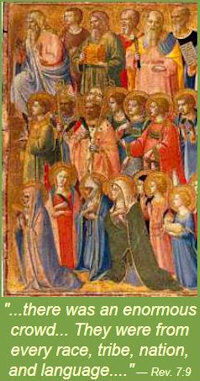 Gathering her children into the Eucharistic assembly and teaching them to wait for the "divine Bridegroom," she engages in a kind of "exercise of desire," receiving a foretaste of the joy of the new heavens and new earth, when the holy city, the new Jerusalem, will come down from God, "prepared as a bride adorned for her husband: (Rev 21:2)." 3 Sacrosanctum Concillium #108, "The minds of the faithful must be directed primarily toward the feasts of the Lord whereby the mysteries of salvation are celebrated in the course of the year. Therefore, the proper of the time shall be given the preference which is its due over the feasts of the saints, so that the entire cycle of the mysteries of salvation may be suitably recalled. 7 Sacrosanctum Concillium, #106, "By a tradition handed down from the apostles which took its origin from the very day of Christ's resurrection, the Church celebrates the Paschal Mystery every eighth day; with good reason this, then bears the name of the Lord's day or Sunday. For on this day Christ's faithful are bound to come together into one place so that, by hearing the word of God and taking part in the Eucharist, they may call to mind the passion, the resurrection and the glorification of the Lord Jesus, and may thank God who "has begotten them again, through the resurrection of Jesus Christ from the dead, unto a living hope." 8 Easter Vigil Liturgy, Blessing of the Paschal Candle.